The Emancipation Proclamation is the most important document of arguably the greatest president in U.S. history. 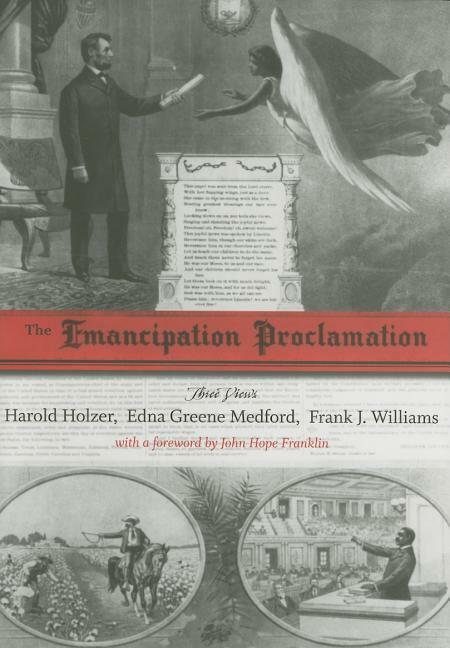 Now, Edna Greene Medford, Frank J. Williams, and Harold Holzer -- eminent experts in their fields -- remember, analyze, and interpret the Emancipation Proclamation in three distinct respects: the influence of and impact upon African Americans; the legal, political, and military exigencies; and the role pictorial images played in establishing the document in public memory. The result is a carefully balanced yet provocative study that views the proclamation and its author from the perspective of fellow Republicans, antiwar Democrats, the press, the military, the enslaved, free blacks, and the antislavery white establishment, as well as the artists, publishers, sculptors, and their patrons who sought to enshrine Abraham Lincoln and his decree of freedom in iconography.Medford places African Americans, the people most affected by Lincoln's edict, at the center of the drama rather than at the periphery, as previous studies have done. She argues that blacks interpreted the proclamation much more broadly than Lincoln intended it, and during the postwar years and into the twentieth century they became disillusioned by the broken promise of equality and the realities of discrimination, violence, and economic dependence. Williams points out the obstacles Lincoln overcame in finding a way to confiscate property -- enslaved humans -- without violating the Constitution. He suggests that the president solidified his reputation as a legal and political genius by issuing the proclamation as Commander-in-Chief, thus taking the property under the pretext of military necessity. Holzer explores how it was only after Lincoln's assassination that the Emancipation Proclamation became an acceptable subject for pictorial celebration. Even then, it was the image of the martyr-president as the great emancipator that resonated in public memory, while any reference to those African Americans most affected by the proclamation was stripped away.This multilayered treatment reveals that the proclamation remains a singularly brave and bold act -- brilliantly calculated to maintain the viability of the Union during wartime, deeply dependent on the enlightened voices of Lincoln's contemporaries, and owing a major debt in history to the image-makers who quickly and indelibly preserved it.